The all new Fonolo website is now up! It reveals more of the details about our enterprise product than ever before. 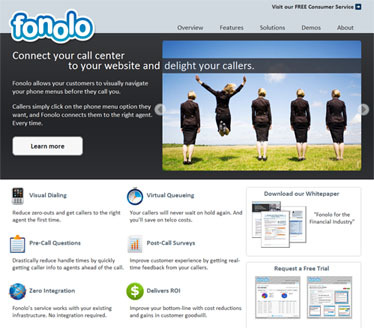 The Fonolo consumer service (that lets anyone Deep Dial to any of the 500 companies in our database) continues to work as before and is still completely free. We’ve just moved it to http://consumer.fonolo.com so update your bookmarks. Our iPhone app continues to work as before. This entry was posted in Fonolo and tagged fonolo on 2010/11/19 by mike.